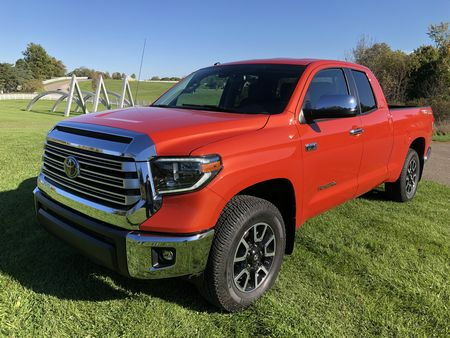 Refreshed for just the second time in its twelve year (and counting) model run, the 2018 Toyota Tundra undergoes a number of changes, the most notable of which is the axing of the regular cab. Other changes include a new mesh grille on some trims, a "billet style" grille on Limited and 1794 models, and the addition of a TRD Sport option for the SR5 trim. Also new this year is the addition of Toyota Safety Sense-P across the lineup. A suite of advanced active safety features, it includes pre-collision warning, automatic emergency braking, lane departure warning, adaptive cruise control, and automatic high beams. 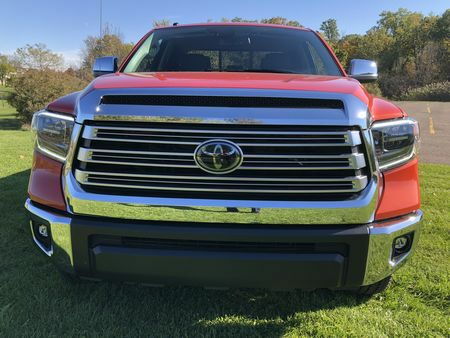 Outside, the Tundra features a vertical grille - laden with chrome on uplevel models – that occupies most of front fascia's real estate. It's bracketed by a pair of square headlamp enclosures bulging out from the bodywork that, on 1794 and Limited trims like our tester, contain LED headlights outlined by LED running lights. The front bumper, fared into the fascia, is blacked out below the grille on Limited models, with chromed end caps that wrap around and extend rearward to the wheel wells. Along the sides, a door handle height upper character line and a more deeply sculpted lower character line midway up the wheelhouse opening prevent a slab-sided look, while the tailgate has the "TUNDRA" name hot-stamped into the lower right corner. That exterior is wrapped around a wide, symmetrical cockpit with logically-arranged controls, that are simple, intuitive, silky-smooth to use, and within easy reach of the driver. The steering column tilts and telescopes, and front seats are nicely shaped and offer of plenty of support on long trips. 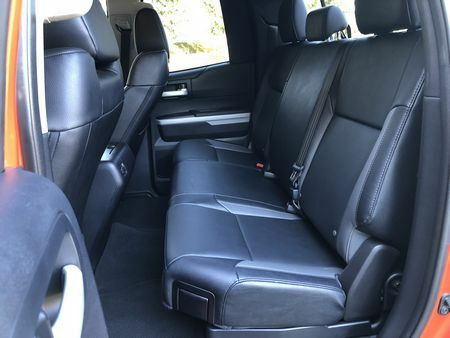 Most models feature ample room for five good-sized adults, with double cab models offering the option of an increasingly-rare front bench (yes, this configuration is still available) and the capability of seating six. The view out both the front and sides is excellent. The view out the back is also decent, but the large B-pillar somewhat hinders the driver's sightline out the rear three-quarters, although the standard rear view camera alleviates most issues. On the negative side of the ledger, adults will find rear seat room tight on double cab models like our tester. And, despite fine graining and close tolerances, the fake wood wood trim on Limited and 1794 models, the extensive use of cheap-looking brushed silver plastic trim across the lineup, and a low-resolution, seven-inch infotainment screen give the interior a decade-old, low-rent look and feel. 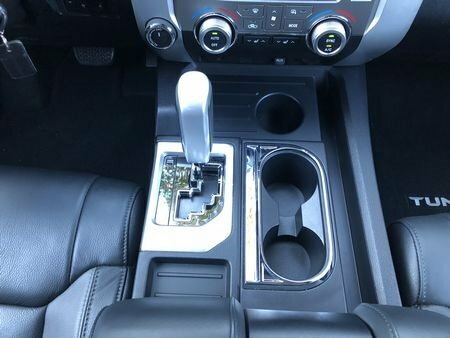 Two V8 engines are available on the 2018 Tundra. 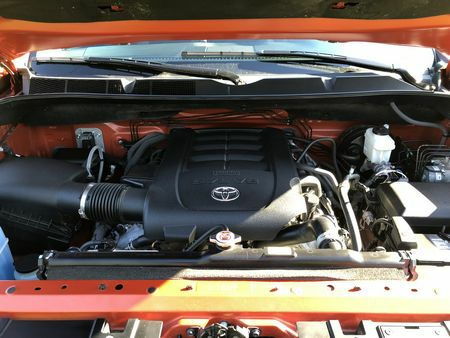 SR and SR5 models are powered by a 4.6-liter, dual overhead cam, normally aspirated V8 that churns out 310 horsepower and 327 lb-ft of torque. On the other hand, Limited, Platinum, and 1794 Editions come with a 5.7-liter, dual overhead cam, normally aspirated V8 that develops 381 horsepower and 401 lb-ft of torque. 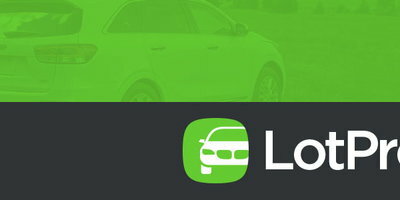 In the fuel efficiency department, two-wheel-drive, 4.6 liter Tundras clock in with an EPA-estimated 15 miles per gallon in the city, 19 on the highway, and 16 combined, while four-wheel-drive models are rated at an EPA-estimated 14 miles per gallon city, 18 highway, and 16 combined. 5.7-liter models, as you might expect, fare even worse, with two-wheel-drive models assigned an EPA-estimated 13 miles per gallon city, 18 highway, and 15 combined, while four-wheel-drive models earning an EPA-estimated 13 miles per gallon city, 17 highway, and 14 combined. Our own vehicle-measured fuel economy was a paltry 11 miles per gallon in city driving. With handling that's composed and confidant, the Tundra does a nice job of isolating even large road imperfections in around town driving. This scenario is repeated at freeway speeds, where the story is pretty much the same: a feeling of stability that's unaffected by crosswinds, grooved pavement, or other pavement irregularities. The suspension has a great deal of travel and does a nice job of absorbing even larger potholes. 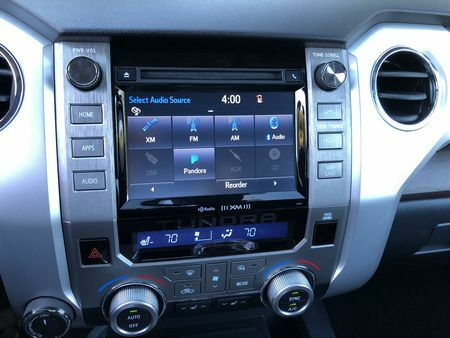 Interior noise is one of the Tundra's best attributes, with sound levels that are comparable to a number of luxury sedans we've experienced. The 5.7-liter V8 on our test vehicle, paired to a smooth-shifting six-speed automatic, offered a muscle-car-like aural experience along with strong acceleration. 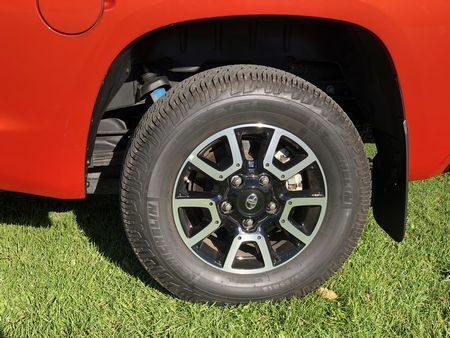 In addition, the TRD Off-Road Package on our Limited tester (not to be confused with the hell-bent-for-leather TRD Pro model) is, for those wishing to venture off the beaten path, a bargain, replete with special wheels, shocks, and tires as well as heavy-duty rubber floor mats, costing a modest $70. 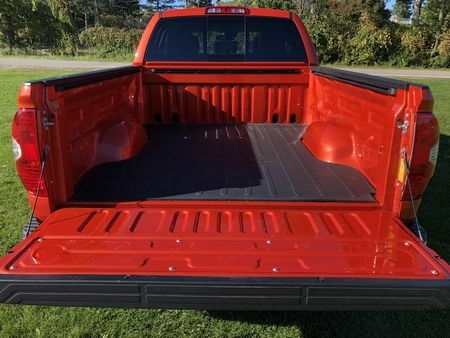 At the same time, road isolation comes at the price of a floaty ride and abundant body roll, the steering is light but there's very little feedback to the driver, no diesel engine is offered, and, although the Tundra comes with advanced active safety features, its crash-test results are middling, at best. The 2018 Tundra is available in SR, SR5, Limited, Platinum, and 1794 trim levels. 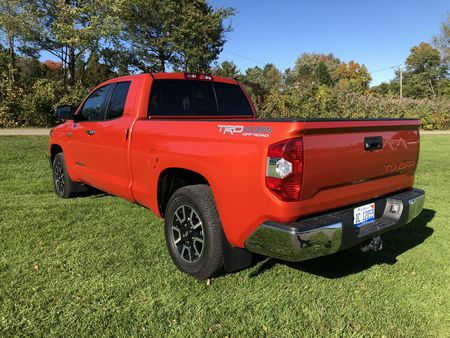 Prices start at $32,415 for a rear-wheel drive base SR Double Cab model and can rise to over $54,000 for a four-wheel-drive, CrewMax Cab, 1794 model with the optional TRD Off-Road Package. 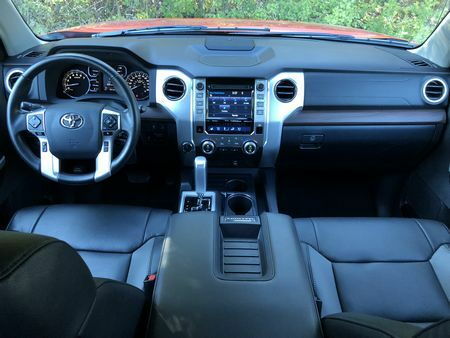 Although dumping the standard cab narrowed down the number of model configurations, Tundra buyers are still face a wide range of choices: in addition to the five trim levels, three bed lengths, two body styles, rear- or all-wheel-drive, and, depending on trim, one of two V8 engines are offered. Models like our Limited tester – the trim we'd pick, although it would be a CrewMax with more rear seat room - come with easier-to-maintain leather seats that are heated and powered up front, along with brighter and more efficient LED headlights and taillights, an auto-dimming inside rearview mirror, 20-inch alloy wheels, dual-zone automatic climate control, a leather-trimmed steering wheel and shift lever, in-vehicle infotainment apps, and satellite radio. 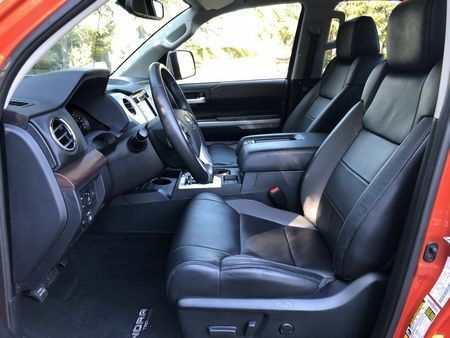 Our Inferno-finished Tundra 4x4 Limited Double Cab had a base price of $43,435 and came with only two options: the budget-friendly TRD Off-Road Package ($70, 18-inch TRD Off-Road Package alloy wheels with black accents and Michelin LTX A/T2 P275/65R18 tires, trail-tuned Bilstein shock absorbers, engine and fuel tank skid plates, TRD off-road floor mats, bed side TRD off-road decal), and a $139 bed mat. Along with a $1,249 delivery fee, it brought the total MSRP to $44,939. A mild refresh and a best-in-class array of advanced safety features add to Toyota's full-sized pickup's reputation for quality and reliability, making it more appealing. 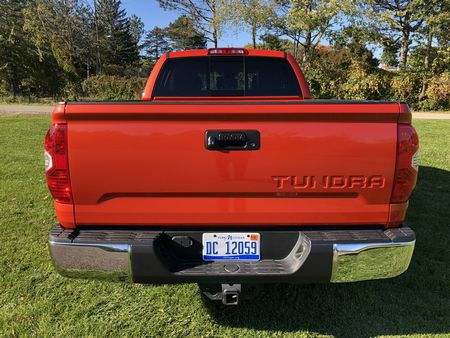 But in so many other areas - including a chintzy-looking interior and poor fuel economy - competitors have left this long-in-the-tooth model behind, making even the latest Tundra an also-ran in the full-size pickup class.